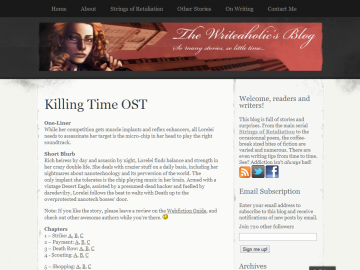 "Lorelei times her murders on a soundtrack played by the music chip in her head." Lorelei Beyer is most renowned as the Nightshade Assassin, the criminal scaling superscrappers and the Most Wanted list alike. Sporting a fake face and a turn-of-the-millennium Desert Eagle, she targets bosses of the tech industry and executes them while a carefully chosen soundtrack plays in her head. During an attack on Merrilyn Technologies, the biggest company out there, she recruited Vexx a hacker, tech-surgeon and former tech-addict. He now lives in her basement and helps her complete her self-appointed missions while he waits for his new identity to come in the mail. Nightshade Assassin - Killing Time OST has not been tagged yet. Help others find Nightshade Assassin - Killing Time OST by tagging it! Nightshade Assassin - Killing Time OST has not been reviewed yet. Nightshade Assassin - Killing Time OST has not been recommended yet.